1. Question: Is it a one time payment or yearly subscription? 2. Question: What is the difference between “Free” and “Pro” versions? There are also some additional features available only in “Pro” version. 3. Question: What networks in your auto-poster plugin are free and what are not? Why some networks are not free? Answer: Plugin makes posts to every social network by calling its Application programming interface (API). Most networks like Facebook, Twitter, Tumblr, LinkedIn (and many others) provide a very good and powerful free API that could be used for publishing posts. SNAP support for those networks are free for you. Some networks like Google+, Instagram, Pinterest, Flipboard, XING, Reddit don’t have public API or have a read-only API that doesn’t allow to make posts. As a result it’s not possible to post there naturally. We have created and now we are constantly maintaining our own API libraries for such networks and those libraries are available separately for some fee. If network has a free built-in API, SNAP supports it for free. You can buy a package of our own API libraries for the networks that don’t have free built-in API. Please see the list of all supported networks. Answer: SNAP is not a spam tool. SNAP is not a Blackhat SEO tool. SNAP is not a tool for bypassing any rules of the site where you are autoposting. You need to follow all terms and guidelines of any site or social network you are working with. Most of the networks (Facebook, Twitter, LinkedIn, Google+, etc..) act on user reports. It means if people are clicking “Report as SPAM” buttons on your posts, you will soon start receiving notices and account suspensions. It really doesn’t matter for them how your posts got there manually or automatically. Question: Can you see what I am posting? Do you share my info with anyone? You are asking for Google/Facebook/Instagram/LinkedIn password. Where it’s kept? Is it secured? Do you have access to it? The main difference between SNAP and other systems is that we are not acting as a middle man between your site and you accounts. All our scripts are installed on your server and your server makes posts to your networks directly. When you make a post your server logins to your account on your behalf and makes a post. We are not involved in that anyhow. None of your information including logins, passwords, and post content is coming to us. We don’t know your info and we don’t want to know it. It’s the best possible solution to any privacy concerns. Your password is encrypted and stored in your WP database. It’s as secured as your server. So please do all possible measures to protect it. As we already explained, we don’t have any kind of access to your password and we don’t want to have it. Question: I got email from Google (Instagram, LinkedIn, Facebook) saying “Your account was accessed from some remote location”, was that you? I am getting “suspicious login” checkpoint. Why? All our API scripts are installed on your server and your server makes posts to your networks directly. When you make a new post your server logins to your account on your behalf and makes a post there. The location that Facebook/Instagram/Google/LinkedIn is asking you to confirm is a location of your server. If your server is far away from your home (usual login location) it might trigger “suspicious login” checkpoint. Please confirm that it was you. It might take several times and then they will stop asking. Alternatively please try to use session instead of username password or vise versa. Question: Does the free plugin support WordPress Multisite (ex-WPMU)? Question: I already have “Pro”, and I would like to upgrade to “Pro for WPMU”. Do I really need to pay the full price? Can I just pay the difference? [line] Question: I am running a number of blogs and I’d like to use your “Pro” plugin on them. Do I need to buy “Pro” license for each one of them? Question: Can I use it just for Twitter (Facebook, LinkedIn, Delicious) or it requires all networks to be set? Question: Can it post to Facebook and Google+ pages? Not to profiles, but to pages. Also what about groups and communities? Question: Why it’s not so easy to setup? Why do I need all those apps? There are other plugins (Jetpack Publicize, Linksalpha Network Publisher, etc ) that could do it much easier. Question: Will the Google+ autoposter work from Germany? Are you using SMS Gateway? I saw another solution, that could work only in US and India, but people were complaining that it wasn’t working even in those countries. 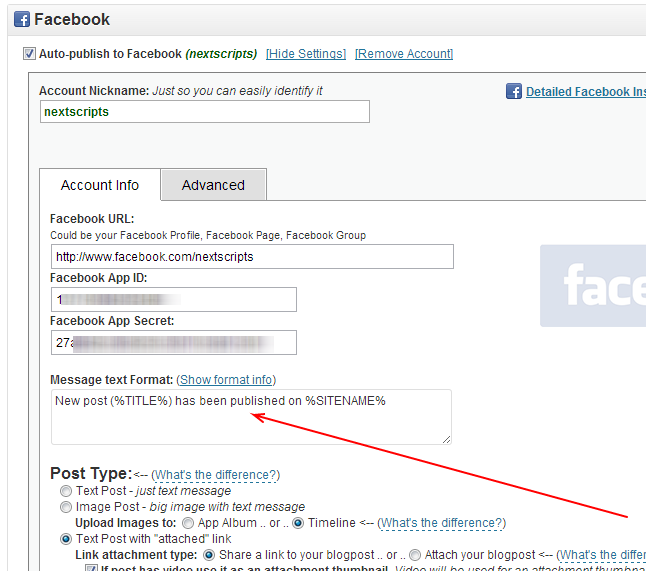 Question: Will your plugin post scheduled WordPress posts to Facebook? I have certain posts to my site that I want to time for first thing in the morning, and also publish to my Facebook page at the same time. Is that a feature your plugin supports? Also, does your plugin support posts from iOS/Android App? Answer: Invoice for each payment is available on “My Page” (https://www.nextscripts.com/mypage/). 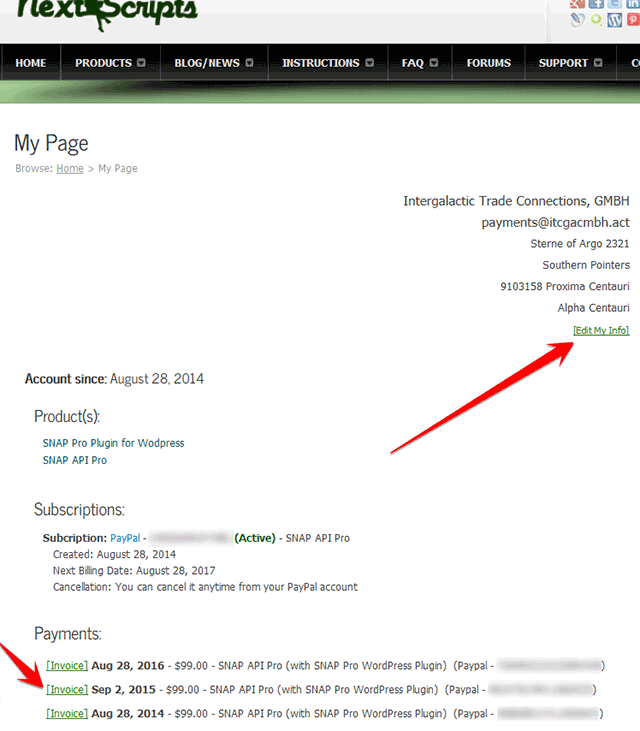 Answer: PayPal subscription can be cancelled right from your PayPal account. Please login to paypal.com and cancel it from there. PayPal Help:How do I cancel a subscription? Credit Card subscriptions can be canceled from your account on “https://www.nextscripts.com/mypage/”. Just click “Request Cancellation” in the list of your subscriptions. Please note: If you do not wish to renew your subscription for another year, please cancel it BEFORE the next scheduled automatic payment. As per our policy, we won’t be able to issue any refunds. Our system will send you 3 emails with the reminder of upcoming payment and instructions how to cancel subscription – 30 days before renewal, 7 days before renewal, and 1 day before renewal. If you don’t take any action you BEFORE the renewal date, you agree to make a renewal payment. We won’t be able to process refund after the payment already happened. 17. Question: How can I update credit card for my subscription? Answer: If you subscribed with PayPal please login to paypal.com and update your payment source from there. If you subscribed with Credit Card please login to your account, go to the “My Info” tab and fill “Update Subscription Credit Card Info” form.